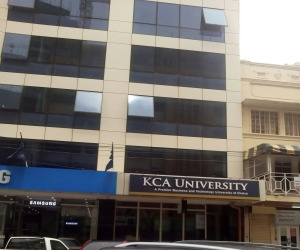 KCA University is located along Thika superhighway in Ruaraka. It is just about 15 minutes drive from Nairobi City Centre. 1. Main Campus - Thika Road, Ruaraka. 2. Nairobi Town Campus - 9th and 10th Floor, Ecobank Towers, Muindi Mbingu Street, Nairobi. 3. Kitengela Campus - 4th Floor Capital Centre, Kitengela, Kenya. 4. Western Campus - Swan Center, Oginga Odinga Street, Kisumu, Kenya. The main campus is comprised of the following schools and faculties. 1. School of Business and Public Management. 2. School of Professional Programmes. 3. Faculty of Computing and Information Management. 4. Faculty of Education and Arts.